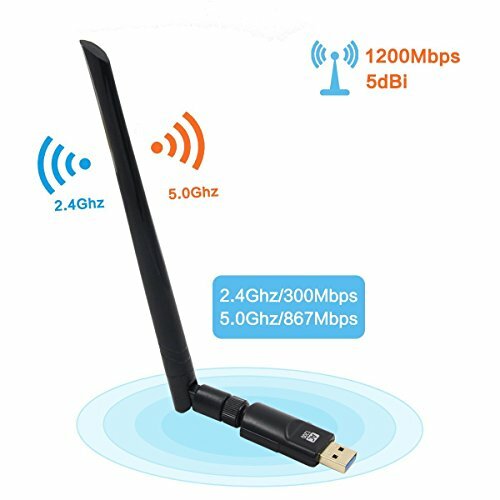 Newspoint New 11AC dual-band wireless WiFi standard technology adapter, can simultaneously be worked in 2.4G and 5G band. 5GHz channel with Strong anti-interference ability and excellent performance. You can establish 866Mbps connection at 5GHz radio or 300Mbps connection at 2.4GHz radio with your WiFi router. 802.11AC wireless transmission technology, compared to existing 802.11n , the transfer rate increased by nearly 3 times. The latest and most powerful WLAN technology, ideal for the seamless connection to online games and HD video streaming. USB 3.0 supports transfer rates of up to 5Gbps-10 times faster than USB 2.0 and gold plated USB ensures USB Wi-Fi adapter maximum throughput performance and more stable internet connection. Backwards compatible with USB 2.0 and 1.1 devices. Adjustable & detachable omni-directional antenna provides high performance and increased coverage for your wireless network. 1) High Transmission Speed: Ultra-fast 1200Mbps wireless speed with 802.11ac and Dual-band connections, 867Mbps on 5GHz & 300Mbps on 2.4GHz. Provide lag-free experience for HD video streaming and gaming. 3) High-performance Antenna: 360°omnidirectional high gain antenna guarantees high RF power, allowing you to pick up wireless signals from long distance. Flexible antenna and Beamforming+ technology help boost speed, range and reliability. 4) Awesome compatibility: No drivers required for Windows 10! Just plug and play! Compatible with Windows 10/8/8.1/7/Vista/XP/2000, Mac OS 10.4-10.12. Works with any Wi-Fi routers, once you've installed the CD and run the software, you can simply insert the adapter to get connected and upgrade your PC,laptop or Mac to work with the latest AC WiFi router for faster speed and extended range. 5) Warranty: Newspoint provides 18 months warranty and lifelong time technial support If you have any question about the product, please Q&A or email to us at any time. If you have any questions about this product by Newspoint, contact us by completing and submitting the form below. If you are looking for a specif part number, please include it with your message.